Paula Vignoni is PhD student in the International Research Training Group "StRATEGy” and holds a diploma in Geology, which she studied in the National University of Córdoba, Argentina. During her studies, she was part of a project focused on the study of lacustrine systems in Antarctica. 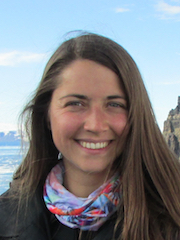 As a result, she did her thesis in the Centro de Investigaciones de Ciencias de la Tierra (CICTERRA) on hydrogeochemical and sedimentological characterization of pristine lake systems in three different islands of the James Ross Archipelago. Now she is staff member of the Climate Dynamics and Landscape Evolution section at GFZ Potsdam. Her research interest is past climate and environmental reconstruction combining high resolution analysis on lake sediments in NW Argentina.